Sanford Firestone, a brake repair and tire store in Daly City, discusses the importance of fluid maintenance and offers tips for customers. Daly City auto repair, Sanford Firestone, providing Daly City and surrounding areas with complete car care since 1971, would like to offer all car drivers tips on fluid maintenance. "Keeping all your fluids clean and full will prolong the life and health of your vehicle," John Sanford, owner of Sanford Firestone, said. "We are all guilty of letting our car or truck maintenance go just one more month or a few more miles. Before we know it, it has been 8,000 miles on the same 4,000-mile oil." 1) When checking fluids, make sure to check all fluids, including engine oil, transmission oil, differential oil, transfer case oil (for 4-wheel drive), power steering fluid, coolant, brake fluid and clutch fluid. 2) Consider switching to full synthetic oil, although this is not recommended for older, high-mileage cars. Synthetic oil reduces friction and wear on engine parts and lasts between 6,000 and 8,000 miles but only costs an average of $15 more. 3) Belt and hose inspections should be be done at the same time as an oil change. For any rubber product on a car, time is as bad as mileage. Daly City tire store, Sanford Firestone offers a variety of vehicle products and services, including tires, brake repairs, suspension work, auto repairs and smog checks. 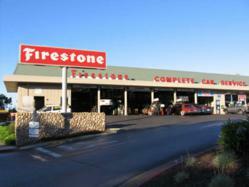 With every oil change, tire rotation or brake inspection, Sanford Firestone also offers a free "Courtesy Inspection." For more information about any of Sanford Firestone’s products or services, call 650-355-1155, view the auto repair shop on the web at http://www.sanfordfirestone.com or visit 705 Hickey Blvd. in Pacifica. Sanford Firestone is the leading auto repair shop located in the Daly City area that offers a myriad of car services, from brake repairs to tire checks to car part replacements. The auto repair shop keeps clients’ vehicles in top condition and offers hassle-free information to protect vehicles and keep them running for a very long time.